On Tuesday morning we started our JR passes and took the express to Kyoto. On the express, the ride is only about twenty minutes, surprisingly quick. After dropping off our bags at the hotel, we walked to Nishiki Market for lunch. 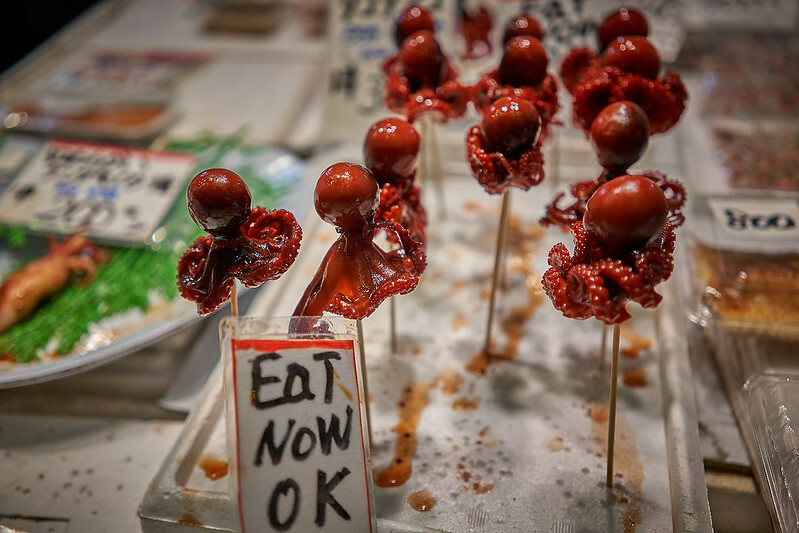 Interesting to look at, but maybe not to actually eat. Unless your name is Sommarat. We were a little bit frustrated because we were refused seats at a few restaurants (apparently for being foreigners) and then were served rather mediocre sashimi at a high price when we finally did get service. After lunch, we walked to Nijo Castle, which turned out to be underwhelming as well. 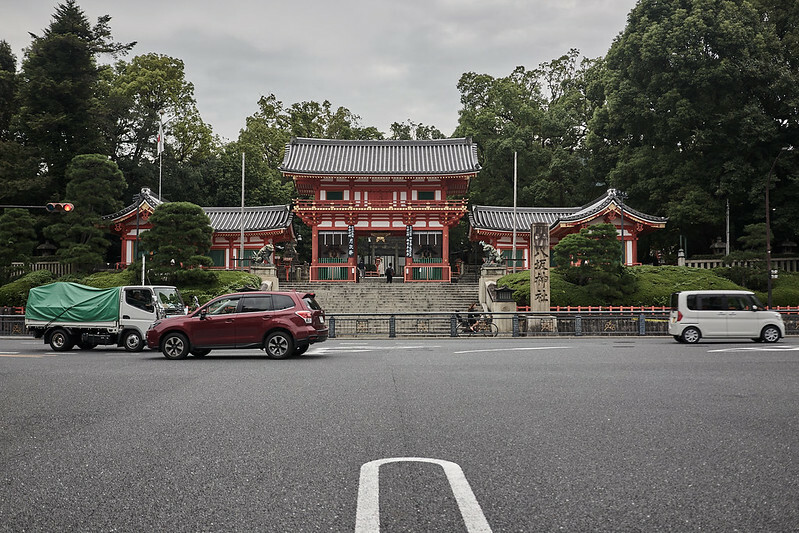 We took a cab across town to Ginkaku-ji temple as the sun was starting to set, walking through lush moss-covered forests with views of Kyoto at the top of the hill above the pagoda. Picture this, but with a thousand tourists jostling for position behind you. 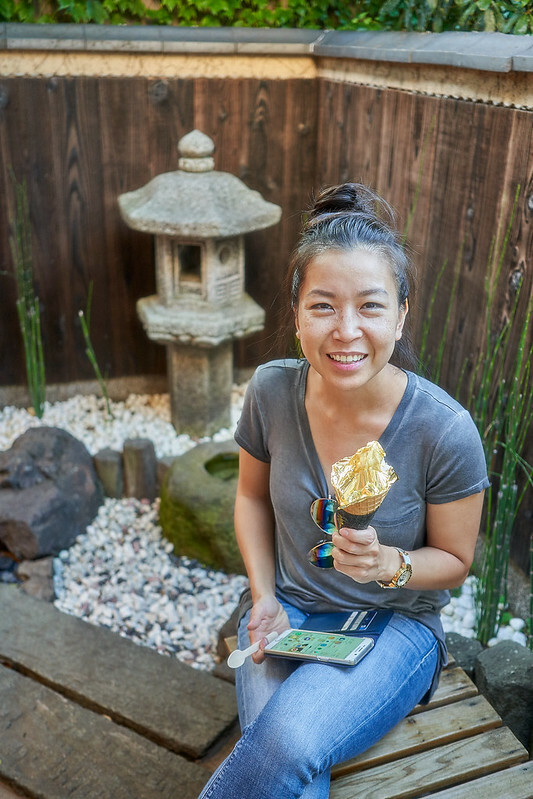 Outside the temple, we ate ice cream topped with real gold leaf. This is a tourist trap sort of thing they developed where this temple is the “silver temple” and another temple in Kyoto (Kinkaku-ji) is the “gold temple” (you’ve probably seen/heard of the gold one before, but not this one) and so at several locations they sell temple themed ice cream with either silver or gold topping. Since something about eating silver seemed just wrong, we opted to taste the gold. 2 Chainz and his gold-plated popcorn ain’t got nothin’ on Sam. 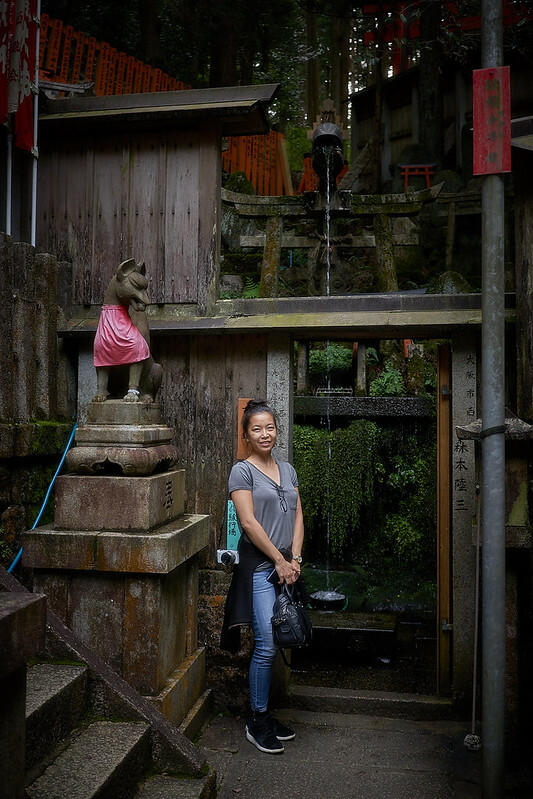 With gold in our bellies, we pondered the symbolism of literally consuming wealth as we walked Philosopher’s Walk on the way to Honen-in temple. After taking a picture of a hut on a bridge I managed to kick my sunglasses (expensive Ray Bans, a gift from Sam) into the koi pond. Is this picture worth a pair of $200 sunglasses? No. No it is not. This was all happening after sunset with no natural lighting, which was why the glasses were hung on my neck instead of on my face and able to drop down on the bridge while I fiddled with my camera. The glasses are gold so they stuck out under the dark water of the pond. We were the only people there so we couldn’t ask for help. Looking around the complex we found some portable caution tubes (not sure what these are called since they don’t have them in the U.S., but they had hollow circles on each end to place over the tops of traffic cones. With Sam providing light via our portable crank flashlight (the same one that got me out of a jam in Joshua tree) after a few false starts I managed to fish the glasses of the water. Triumphant, we celebrated by taking a cab to Nanzen-ji temple, but there wasn’t a lot of light in the complex so we didn’t stay long. 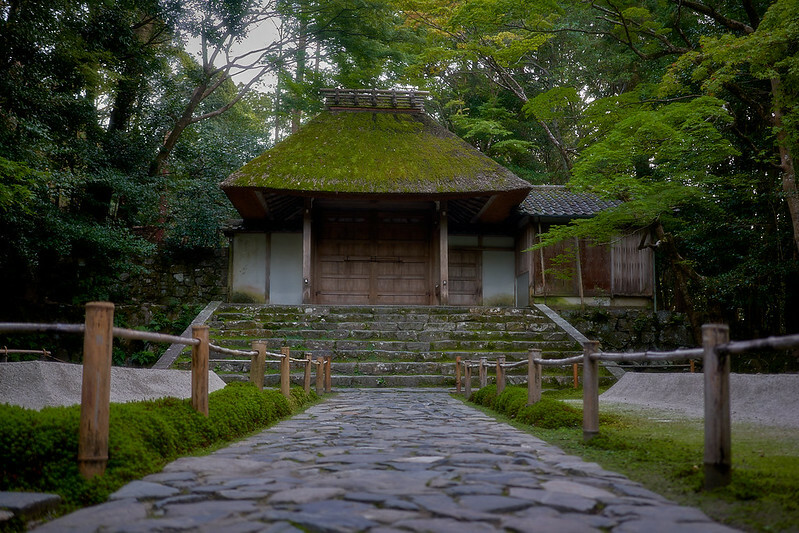 Shrines and temples are either soothing at night or spooky. This one leaned more toward spooky. Across the street from our hotel, we ordered a quick bite at a hip place. Sam asked to have the cook put more time into her nearly-rare beef bulgogi. After several more days of this, we realized that most beef is apparently consumed nearly raw in Japan. Also, “American Beef” is a big thing apparently. Wednesday we set out walking with the goal of weeding our way north until we reached Yasaka Shrine. 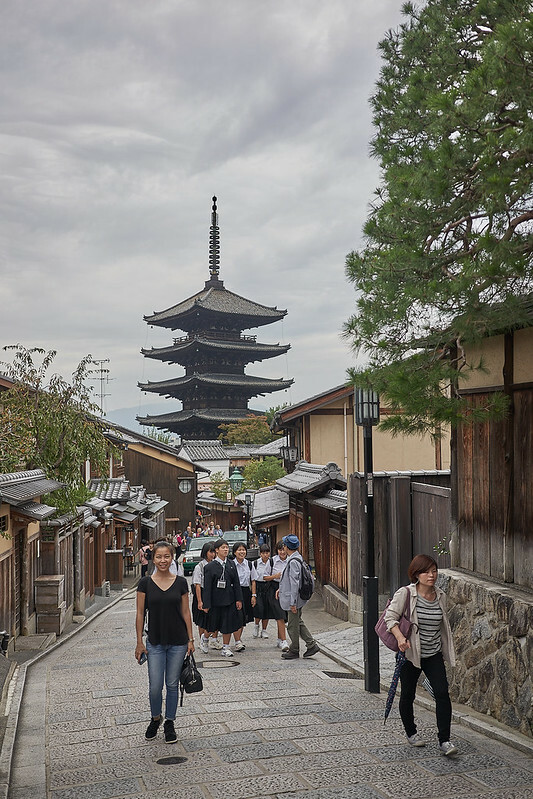 Kyoto has so many UNESCO sites (17) that some of them sit right on busy intersections. We wandered down the back road from Yasaka visiting shrines and temples we’d not researched until we came to the famous one that sticks out in a crowd. Of people. Because it’s also on a busy intersection and crowded with people. This is what we thought the entire city would be like. It wasn’t. Except for the tourists; lots of those everywhere. Unfortunately, it was raining most of the day. Doubly unfortunately, Kiyomizu-dera was covered in scaffolding and tarps for a renovation. Triply unfortunate, we bought tickets to the temple of a thousand Buddha’s only to find out no photography is allowed inside. Wet and tired we took a break back at the hotel before walking to the Kyoto tower for night views of the city and a good dinner at the food court underneath. Squint and you can just barely see the scaffolding on the mountain completely covering one of the most famous buildings in the world! 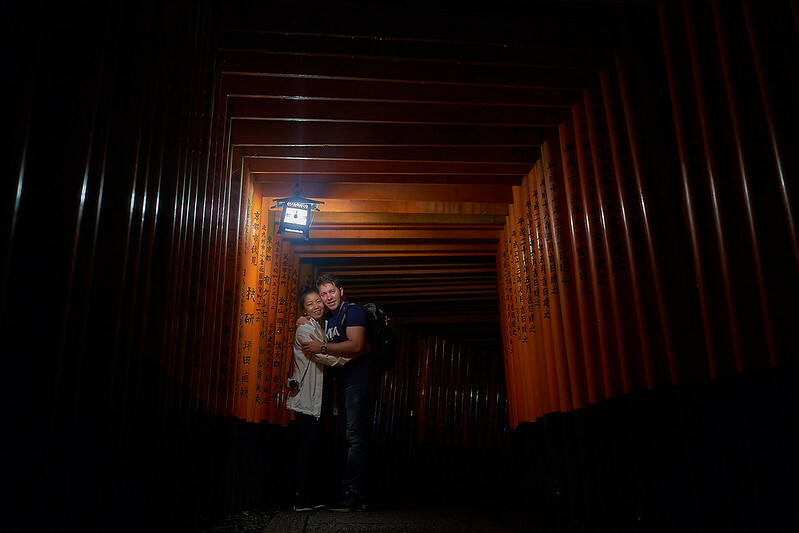 After dinner, we took the train to Inari to walk the famous orange Torii gates on the staircase up the mountain. What we didn’t know is that the stairs are closed at night after the first flight. Who knew Christo put up Gates in Japan? I missed his exhibit in Central Park, but this totally makes up for it! 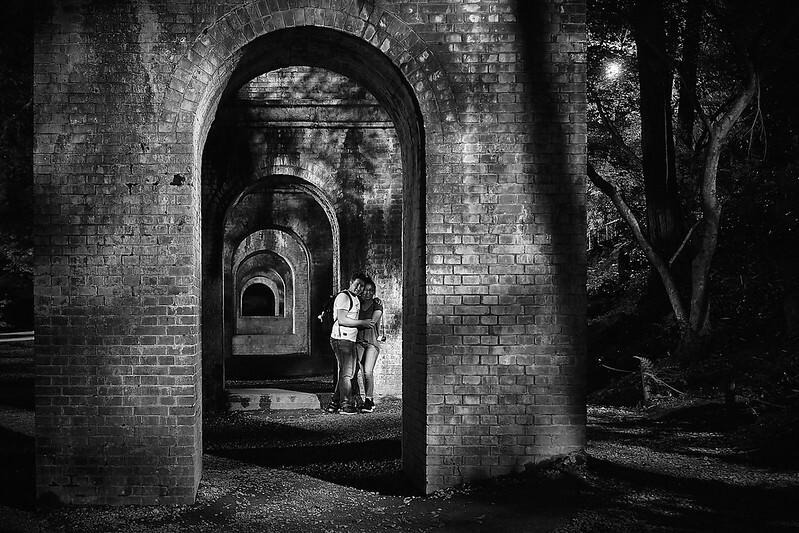 As we walked down a concrete path on our way back from the shrine we heard a large animal grunting and snarling from one of the open areas. The path was poorly lit and the animal was somewhere in the dark patch of grass between our steps and the woods that cover Mt. Inari. 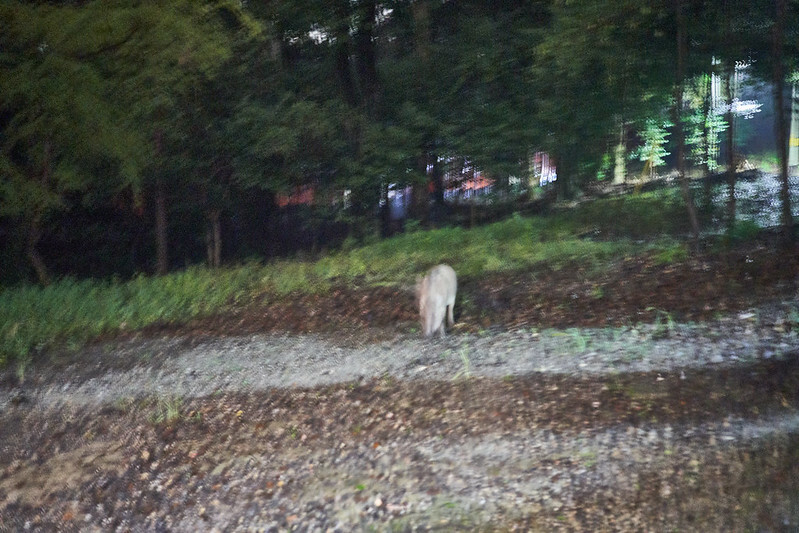 When Sam shone a flashlight on it we discovered it was a wild boar a few feet away. It was ten feet tall and had tusks as thick as your head, I swear! It was eating and seemed annoyed that we interrupted. After a few more snarls in our direction, it loped off into the woods. We would later come back to the shrine in daylight and see warning signs all over the place to avoid the boars. Woops. In the morning, we walked to Kyoto station to travel northwest to Ashiyama to ride the “romantic train.” Unfortunately, the leaves hadn’t changed yet, so the view from the train was not very impressive. This is what happens when a girl with a thousand Instagram followers sees something “not very impressive”. 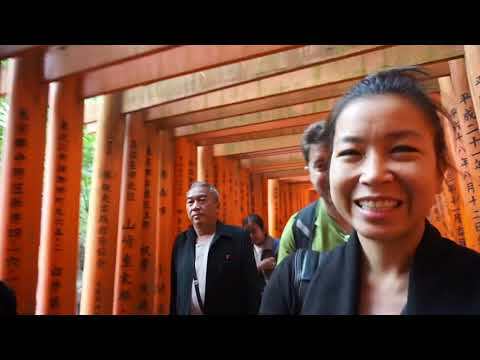 We actually had more fun in Ashiyama-proper at the souvenir shops and eating the traditional “Japanese Pizza.” (the last bit of the video at the top of this post) Our last daylight trek took us across the river and up the mountain on the other side to visit our friend and see some monkeys. Not a picture of our friend. Our friend (from Hong Kong/LA/Michigan) joined us at the monkey park as she recently moved to Nagoya. 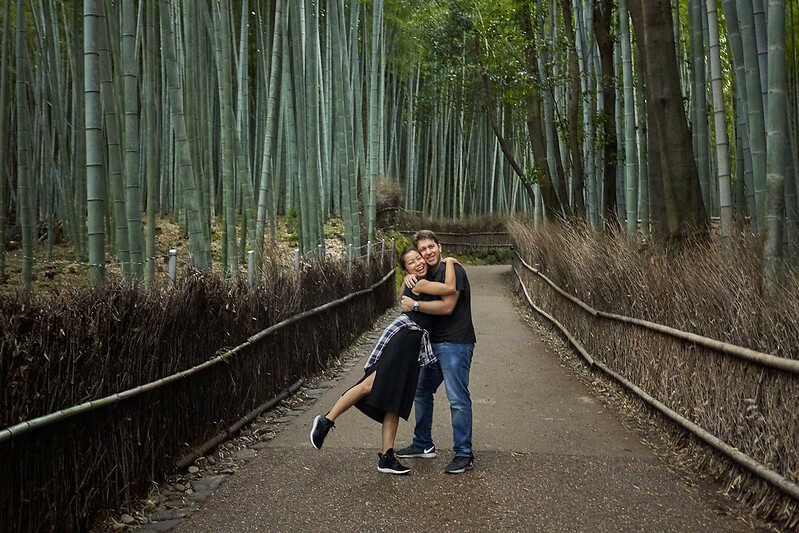 We walked back through the bamboo garden at night together, which, curiously had none of the lights we had seen in photos and had nearly completely cleared out by nightfall. 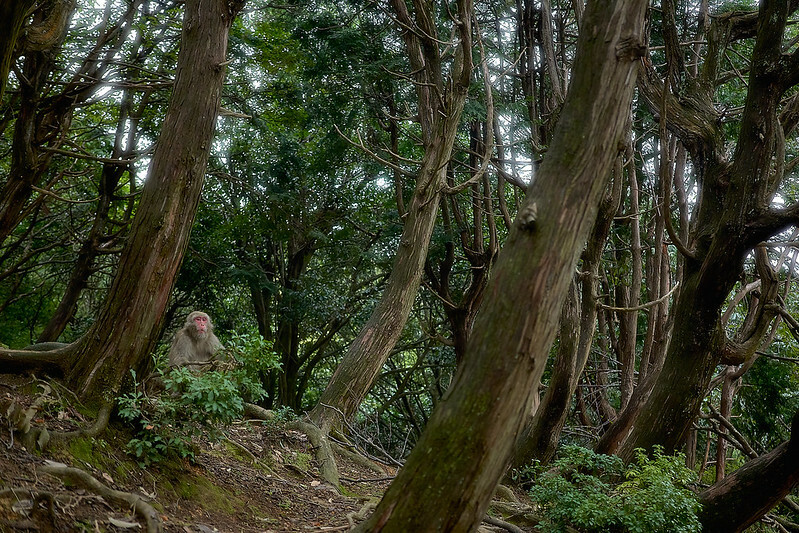 It left the place curiously creepy feeling (American horror movies often take place in the deep woods, so maybe Japanese ones could be deep in the bamboo forest?). A good camera makes a handheld night shot just look like… a blurry photo taken with a bad camera during the day. There’s some kind of mystic wisdom there…not sure what. 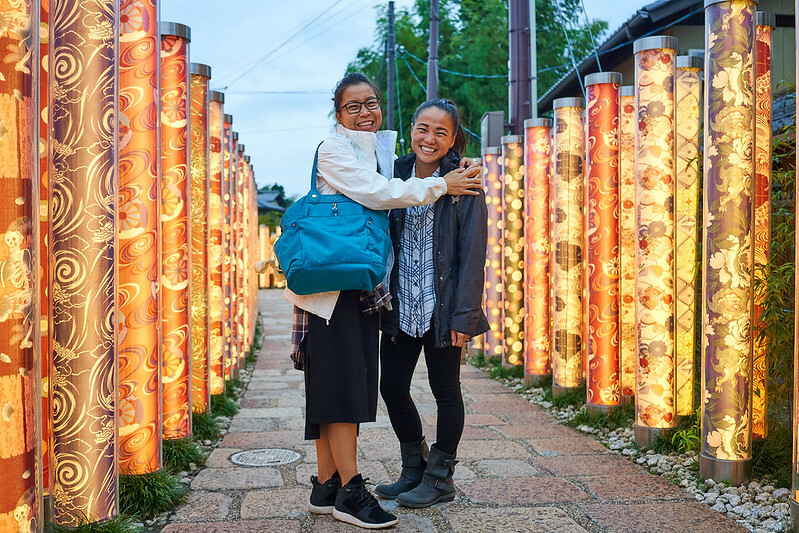 We walked back to town and visited the Kimono Forest again since the “trees” light up at night. And the people. Less creepy than bamboo, right? We took the train back to Kyoto together and our friend found a BBQ restaurant within a few minutes walk of the station. 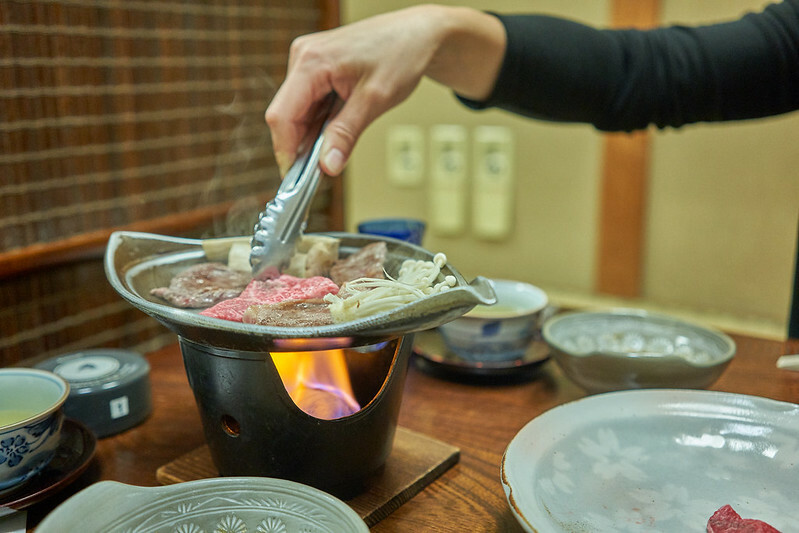 The place was a pork-only joint with a small circular burner at every table. The locals sitting on the same bench with us asked where we were from and how we found the place because “this restaurant is for regulars only and foreigners don’t know about it.” Only one employee (the manager, we think) spoke any English. No pictures allowed. They cut the meat from pork carcasses on the same counter we paid for our meal. You want more meat? Whack! Here you go. Ralphie’s mom wouldn’t have liked this place one bit, but we did. After the meal, we walked back to the station to see our friend off to Nagoya, but not until eating some ice cream first. Japan sells fully formed ice cream cones in the freezers at convenience stores. 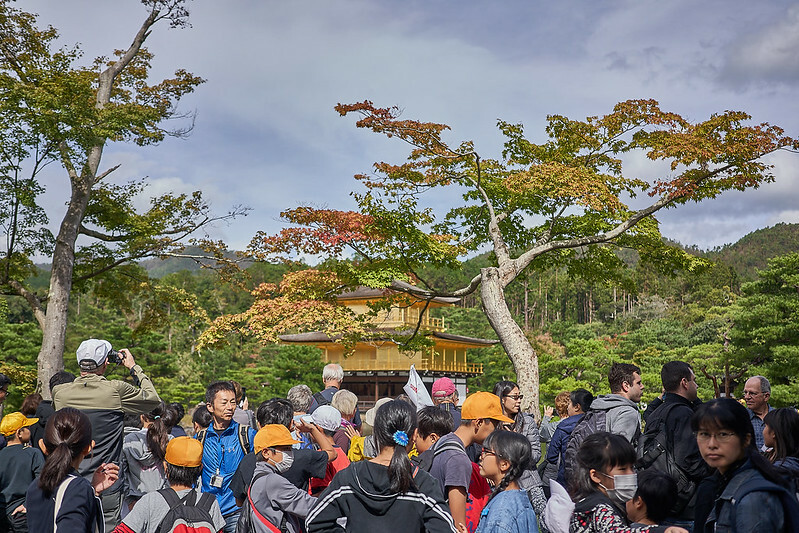 On Friday we took a taxi to Kinkaku-ji, the golden temple or “golden pavilion.” There were thousands of Chinese tour groups and Japanese kids on field trips. Maybe the largest throng of tourists we’ve seen in any one spot on Earth in our travels thus far. Did you get that picture of the serene and tranquil zen essence of the pagoda? Hurry up! We’re talking Trevi Fountain levels of tourists here, all scrambling to get that perfect shot of the gold-adorned Pagoda. We figured if you can’t beat em, join em, and started taking pictures with the children (who delighted in saying “Herro! Herro!” to us to practice their English). “Walk! Stop! Look at me! Walk!” One wonders how many of these kids got to look at the pagoda in real life. 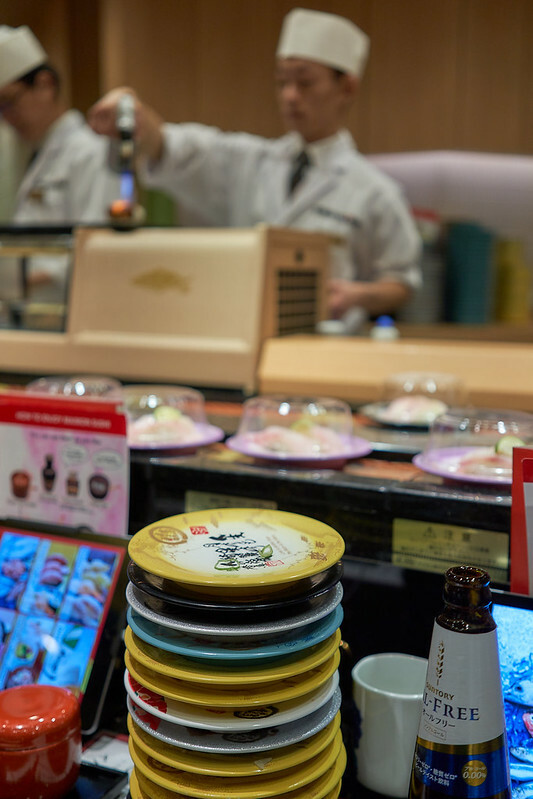 We took a cab back to the nearest JR station to visit Inari during the day and finish our hike to the top, but first, we sated our hunger with a stop at the floating sushi restaurant. Back at the shrine during the day we were determined to hike through the thousands of torii to the top of Mt. Inari. And so was every other tourist in Kyoto. 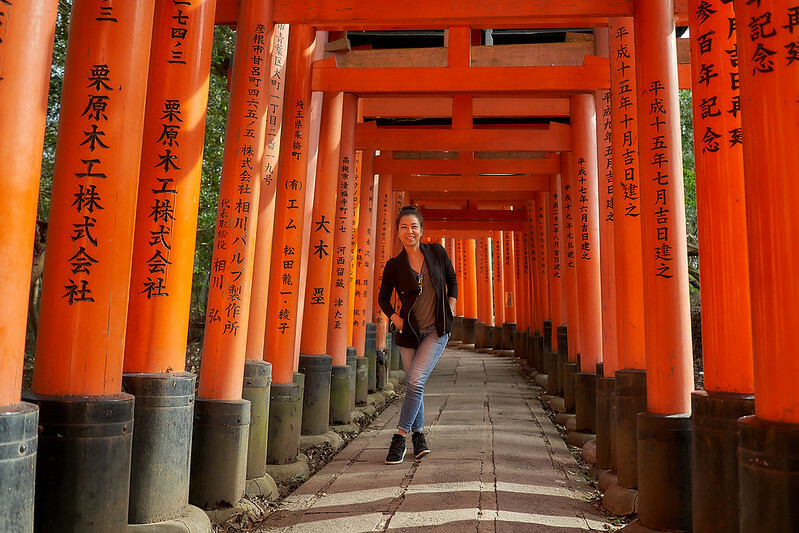 There were more people than torii, so getting a photo like this took patience and good blocking. I can’t tell they’re all actually Chinese from the back, can you? 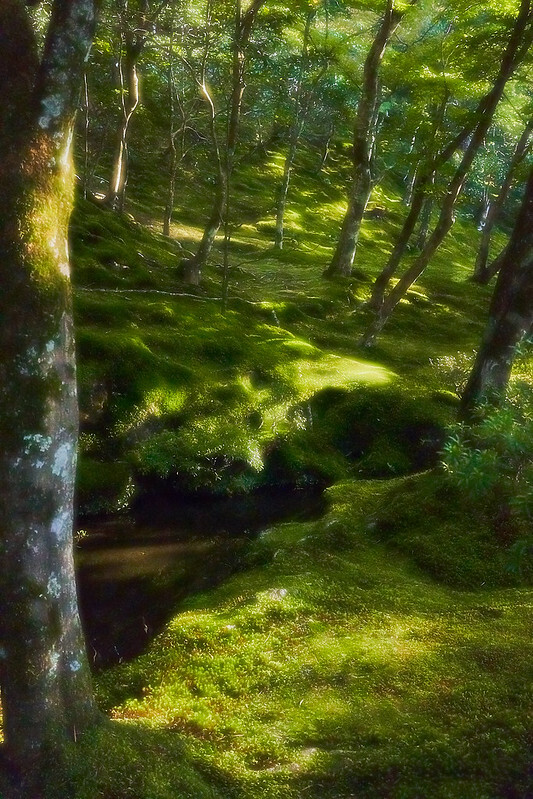 On our way there we misunderstood the map and took a wrong turn into the forest valley at the base of the mountain where we found a small shrine covered in moss and a tiny man-made waterfall. Only the most vicious guard dogs wear pink dresses. 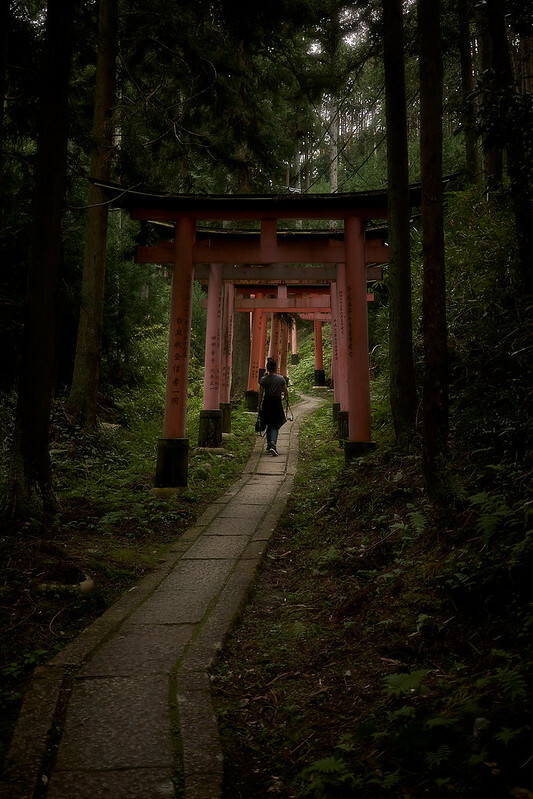 The trail took us by a small town and back up the hill, where the torii started again and relieved us that we weren’t totally lost. It’s weird to take a low light photo, increase the exposure in the computer, then add darkness back in. But there you go. It’s “emotional” now, right? We finally reached the true top of Mt. Inari about an hour later only to discover there were no views at all from the small shrine. 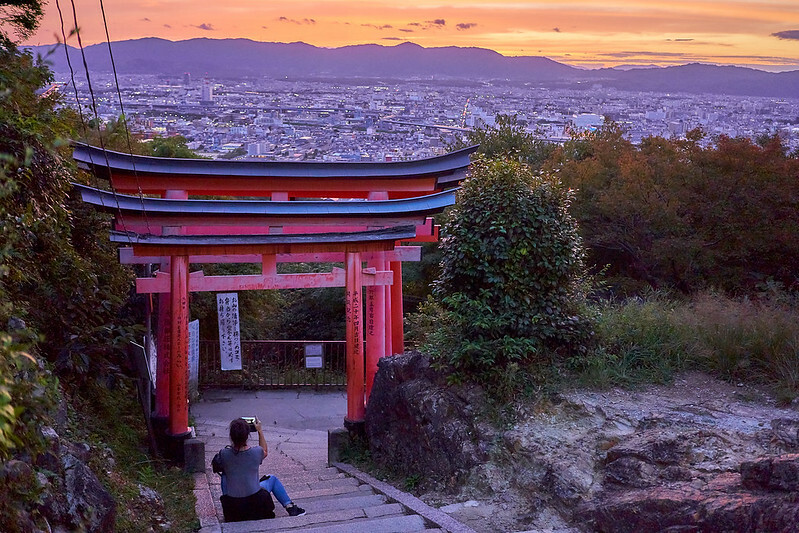 I ran back down the trail to the earlier viewpoints to take photos of the sunset over Kyoto. 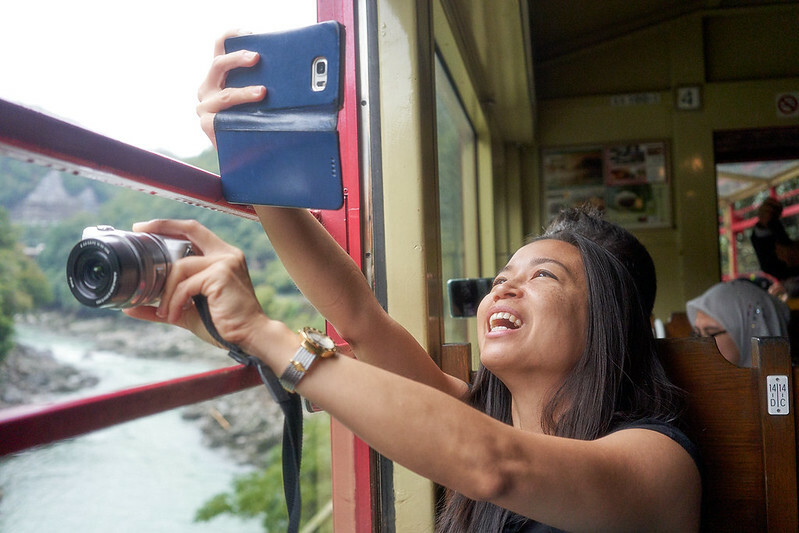 How the Instagram sausage is made. 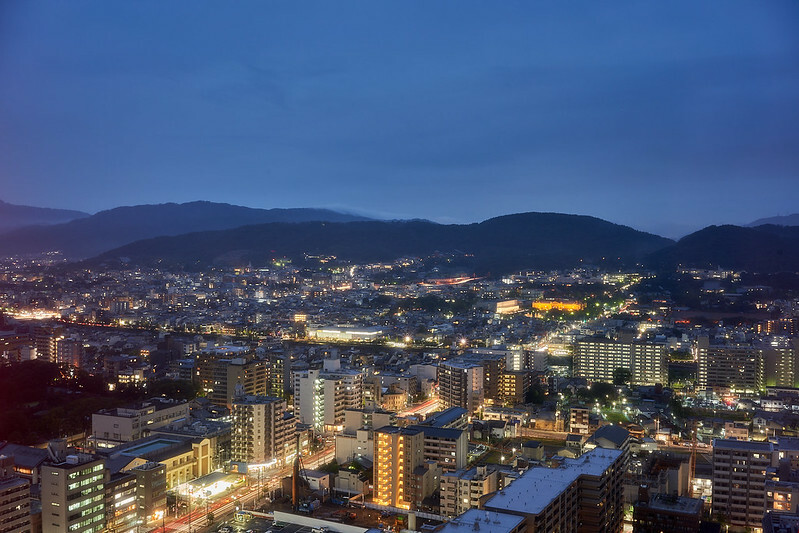 After walking out of the mountain in the dark we took a cab north to the park behind Yasaka Shrine and ate at a kaiseki restaurant recommended by our cab driver who assured us it was just as good as the others that cost $200 per person up the same street. In the states we throw in some beans and call this “camping.” (We did sit on the floor while we ate, inhaled other people’s cigarettes, and saw a raccoon outside, so the experience isn’t as dissimilar as you might think, except for the price. After dinner, we took night photos at Yasaka shrine and walked down Shijo Dori looking for the real geishas our driver told us about. 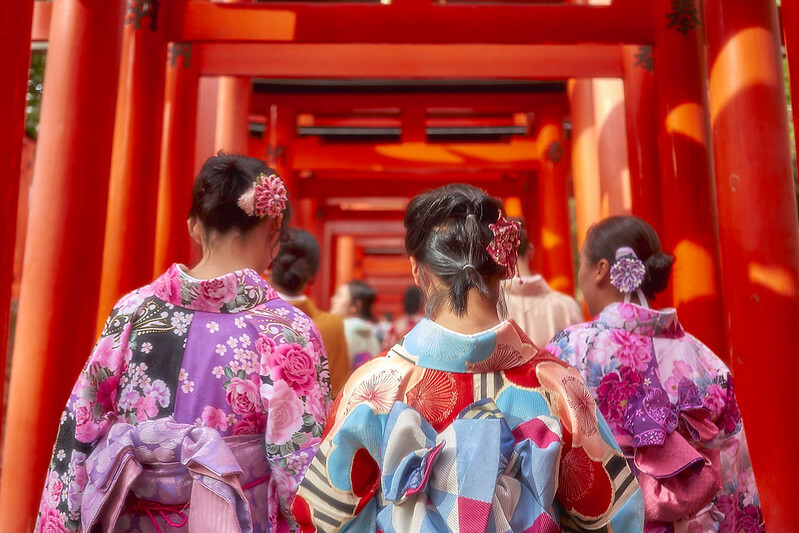 Most of the geishas you will see in Kyoto are just Chinese tourists who rent kimonos at souvenir shops. After a while, we didn’t see any geishas and it was getting late so we hailed a cab. As the cab drove through an alley we finally saw two real geishas, and even though the driver stopped, they ducked inside a doorway and we didn’t get any photos.